« In The Mix – Live! WHAT IS THE “MS. CREATIVE CLASS”? 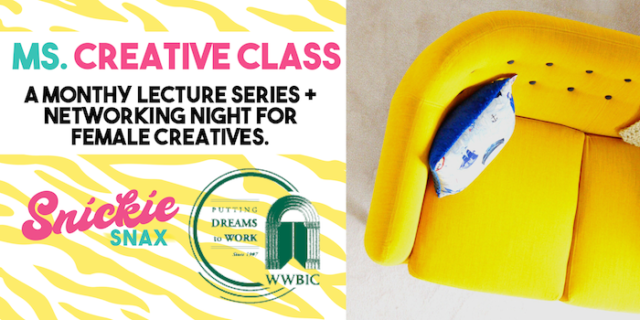 The Ms. Creative Class is SnickieSnax innovative monthly gathering for entrepreneurial-minded women in and around the Milwaukee area, to network and learn from some of the best in the female founder game. Check out our topic for the month, and join us to soak in the stories and advice from the female founders who define what it means to be your own boss!! We’re coming at you with a new speaker every month, who has either founded a business of her own, and/or has skin in the game when it comes to being a fierce female leader. Each Ms. Creative Class you will hear stories and lessons from our VIP guest, ask questions, take notes, and network with some pretty amazing female founders. Get ready to expand your own creativity and take your business endeavors to a whole new level! This monthly series is inspired by the whitespace that exists in the Midwest to connect like-minded creative women, who are craving opportunities to connect with one another. SnickieSnax mission is to educate, support, and inspire female founders to be their own boss, and the Ms. Creative Class is just one way we can help accomplish this goal!! -More friends – Who doesn’t want to meet like-minded creatives? Did someone say future collabs?? Networking can be fun, ya know. -An enlightened mind – Hear how the best in the entrepreneurial world do what they do. -Clarity and tools to help your business/brand in its struggle areas. -Inspiration and ideas for your personal and professional life. The Ms. Creative class is held in partnership with WWBIC (Wisconsin Women’s Business Initiative Corporation) and is held in WWBIC’s Milwaukee space located on the beautiful riverwalk downtown. At the class, your time will be split between networking with like-minded female professionals and entrepreneurs, and learning the stories, concepts, and advice nuggets in lecture format from our VIP special guest of the day. Each of our VIP guests is an established female founder and/or has skin in the game when it comes to being a female leader in their niche or city. Get ready to learn from the BEST!! Are you setting aside the time to grow yourself and your business? SnickieSnax is providing you with a monthly opportunity to get out from behind your computer screen, NETWORK, expand your knowledge, and be inspired to GO FOR IT. You may already have a good thing going, but we’re offering the opportunity to learn from the BEST, and GROW that biz of yours to the next level!! -ANY female creative/solopreneur/entrepreneur/influencer — whether you own a business (online, brick and mortar), have plans to launch a business, or are just inspired by female leaders in your community and want to come out and support! -My gals out there currently working for someone else, but inspired to work for herself. -People who are feeling frustrated or confused about what to do with their time, and how best to contribute something meaningful. -Those who feel called to CREATE something of value and share it. -Those who feel called to CONNECT with a community of like-minded female creatives. -Those who feel called to CONTRIBUTE great work because it brings you JOY, FULFILLMENT, and a sense of PURPOSE!! -Whether you’re a CEO, photographer, artist, content creator…you name it…part-time, full-time, or side gig—if this message speaks to you in any way, we want you THERE!!! Don’t second guess attending—this is your opportunity to SHOW UP! -Anyone expecting a clearly defined path to success—we all have our own unique journeys! -Anyone not willing to WORK for results and answers. Growth doesn’t happen overnight. -Anyone expecting freebie collaborations, deals, or giveaways from our VIP guest speakers. Our special guests are simply here to share advice/stories and answer questions for your benefit! We are excited to hear what you are creating, and inspire you to be your own boss! Go Get It, Go-Getter!